This post may include affiliate links which means if you buy something through the link, I get a small commission. I only recommend products and services I have used/done myself and love and think you’ll love too! 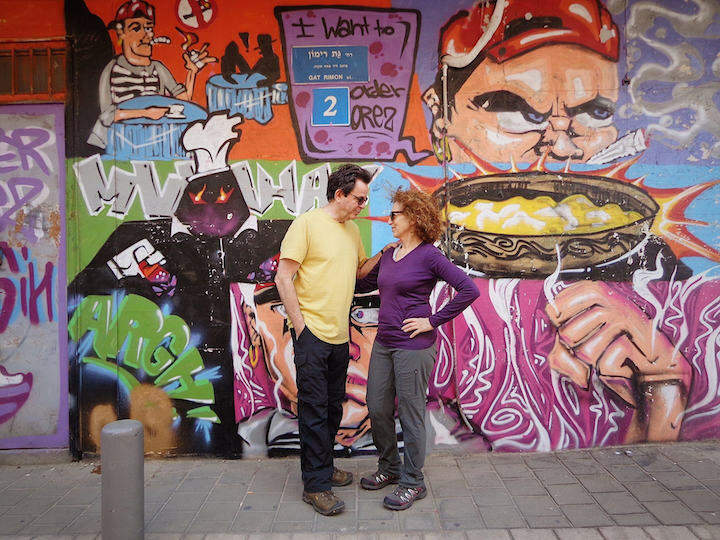 We spent the first few days exploring Tel Aviv and Jerusalem. We spent our first night walking around the city and getting our bearings. Tel Aviv is a fairly small city so it’s easy to explore by foot. That first night we stopped at The House of Hummus aka Hummus HaBayit for our first taste of hummus, Israeli salad, and shakshuka. It’s a small little place, fairly cheap, and super delicious. We had a late start the next day as my parents were pretty jetlagged. Once they were up, we walked to Shuk Ha’Carmel and bought bread, cheese, tomatoes, olives, and pastry and had a picnic in small park visible once you get to the end of the shuk street (I couldn’t find the name of the park). Then we walked along the path by the sea into Jaffa. The beach looked so lovely. If you’re a beach person and you’re in Israel when the weather’s warm, definitely plan some beach time. We went to the Jaffa flea market and walked around, then walked home. The next day we decided to venture out to Jerusalem by bus. We scrambled to organize a private tour guide for the day and ended up with an amazing guide named Amitai. We did a 5-hour tour of the Old City with him, ending at the Mahane Yehuda Market. Then we dined at a Moroccan restaurant by his recommendation called Hamotzi which is right next to the market. The food was super yummy and unique. 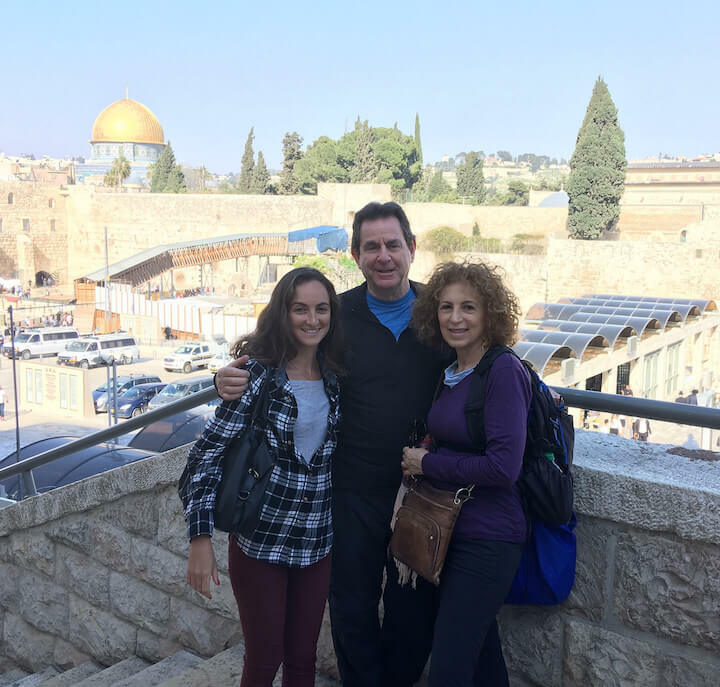 We LOVED having the private tour guide for the Old City in Jerusalem and I would highly recommend getting one if you go. Without a guide, it just feels like a bunch of old buildings and you have no context for what you’re seeing. You’ll need to go to one of Tel Aviv’s bus terminals. We chose the Central Bus Station but there are a few others that might be closer to where you’re staying. Once there, you’ll need to take the Egged bus number 405. It costs 16 shekels per person and you pay once you board the bus. When you arrive at Jerusalem’s Central Bus Station, you can take the light rail which is just outside the station to your final destination. If you’re going to Jaffa Gate to enter the Old City, don’t exit the light rail at Jaffa station but instead the next stop. *Please be aware* the area around Tel Aviv’s Central Bus Station doesn’t feel super safe so I don’t recommend walking through it to get there or wandering around the area alone/at night. You can take a taxi or public taxi van (sherut) there instead. We spent the following day in Jerusalem as well. 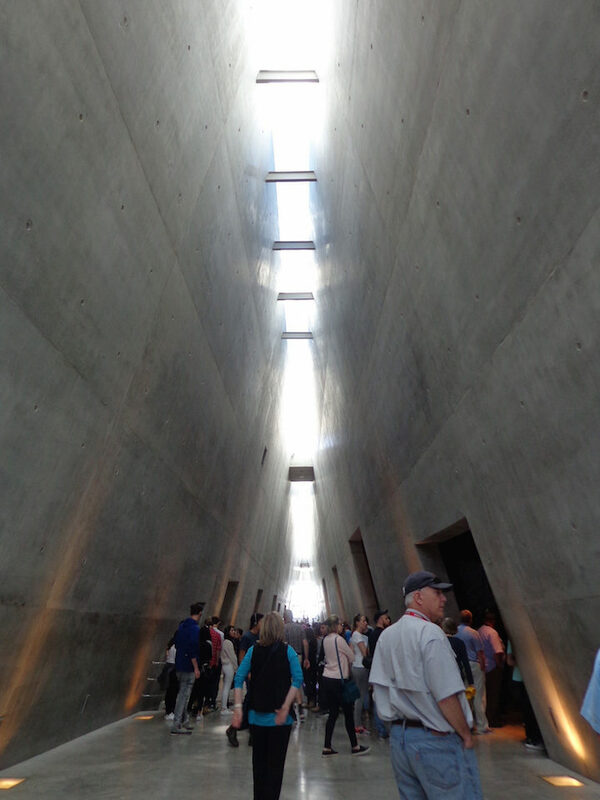 This time we went to Yad Vashem, the Holocaust Museum. It’s very easy to get there from Jerusalem’s Central Bus Station: Just hop on the light rail and get off at Mount Hertzl. Then ask or follow signs to the museum which is a 5-10 minute walk from the stop. We could have used more time at the museum so I recommend going in pretty early. The main exhibit is really comprehensive and well done, and there are lots of other memorials and exhibits to see but we didn’t have time as we were there right up until closing at 5 pm. By the way, the museum is free! 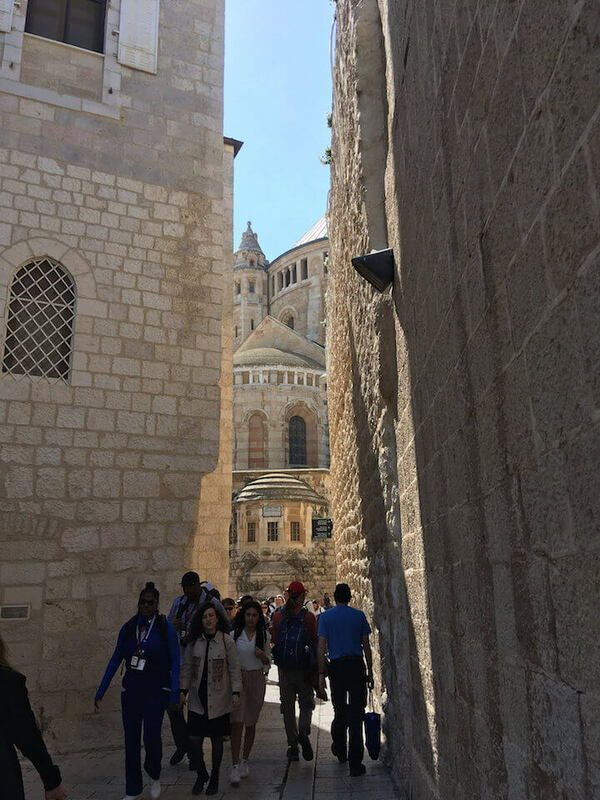 We hopped back on the light rail and went back into the Old City to catch the Western Wall Tunnels tour. 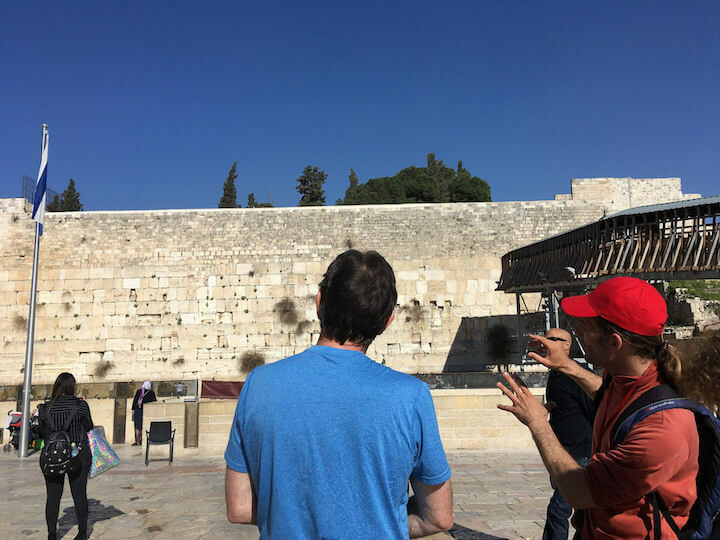 This is one of my favorite things in Jerusalem – this was my second time doing the tour and I find it gives really good context and visualization of what the Temple Mount is all about. We had bought tickets for it the day before when we walked by their ticket office but I recommend booking tickets online ahead of time. Make sure you book in the correct language! On our last day in Tel Aviv, we rented a car and packed up and drove into the desert! 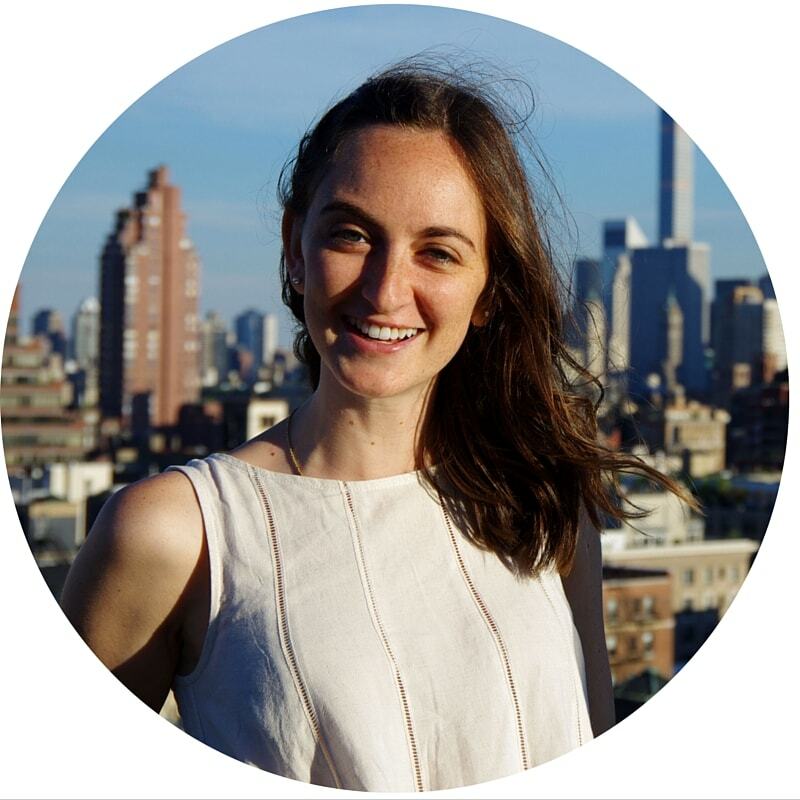 We based ourselves in a lovely 2 bed/2 bath Airbnb apartment in Tel Aviv (click here to get $40 off your first Airbnb stay!) and made day trips to Jerusalem when needed. The apartment we chose was well located for walking around Tel Aviv and was very comfortable for three people, with high ceilings and tasteful furnishings. If you are on more of a budget, I can recommend staying at Abraham Hostel in Tel Aviv. I’ve stayed there before and got the best hostel dorm room sleep of my life! 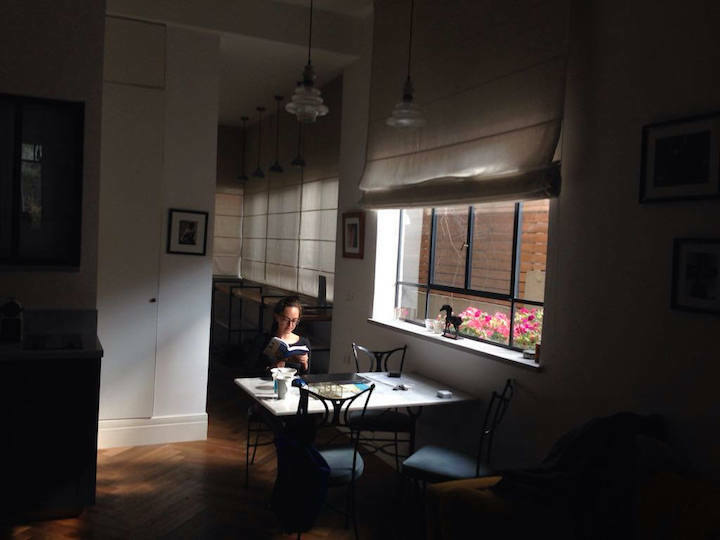 It’s a really large hostel with many tours and activities available and it tends to attract older travelers and families in addition to the usual youth backpacker crowd. PLUS they have an excellent free breakfast!! It was nice having the apartment in Tel Aviv and not having to move our stuff around for a few days, but I think looking back it would have been easier to just stay in Tel Aviv the first few nights then rent a place in Jerusalem for a couple nights. Taking the bus back and forth and using public transport to get to and from the bus stations for two days was a bit trying, not necessarily in terms of time commitment but in terms of energy and convenience. We rented a car for the rest of our trip, which I would definitely recommend. We drove from Tel Aviv to Mitzpe Ramon, caught a quick dinner at the small town’s most popular restaurant, Hahavit, then did the astronomy tour with Ira the Starman of Mitzpe Ramon (here’s the TripAdvisor page). My mom had signed us up for the tour but you can probably also register once you arrive to Mitzpe Ramon. The tour was breathtaking and so informative. 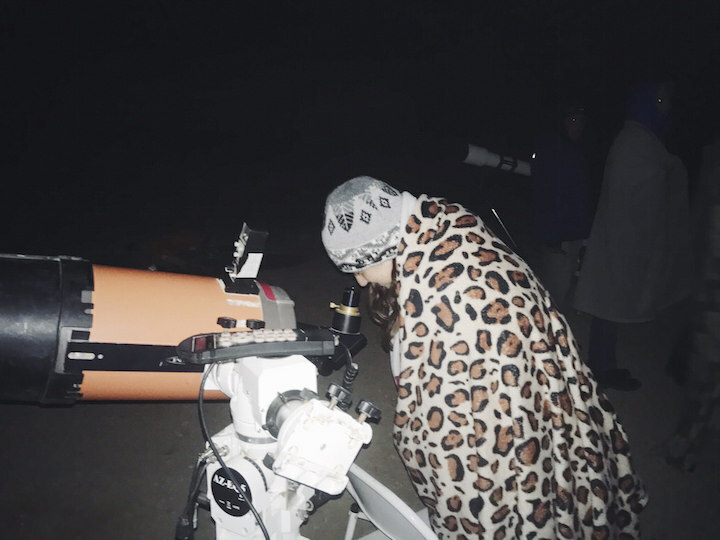 Ira walked us through a naked eye viewing of the night sky then we got to watch Jupiter rise and look at some distant galaxies through a telescope. It took about 2 hours total. I definitely recommend the tour, just be sure to bundle because it’s freezing cold out there in the desert at night. The next day we drove around the makhtesh and stopped at interesting spots. There was very little information even at the Visitor’s Center about hiking in the makhtesh, or erosion crater. Most hikes seemed to require someone to come pick you up or hitchhiking back at the end. So we opted for a short walk through the rocks and looked for fossils and took photos instead. We spent the next day in Makhtesh Ramon as well. This time we drove out into the crater and parked to go on a short hike to the Ammonite Wall and back. 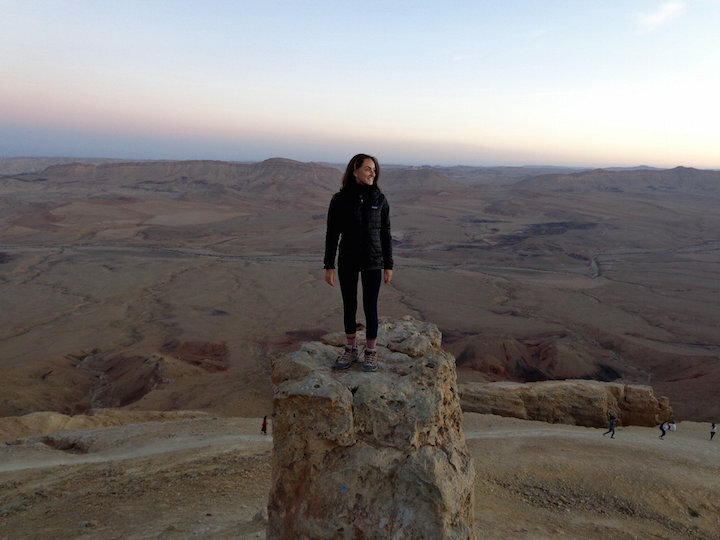 We climbed Har Gamal back in town to watch the sunset and since it was Friday night, we also got to see the locals gather to bring in Shabbat from the edge of the makhtesh. We found the Friday night jazz band in the industrial part of Mitzpe Ramon but it cost 50 shekels a person and we weren’t that into the music so skipped out on it in the end. We stayed in a 2 bed/1 bath Airbnb apartment in Mitzpe Ramon (click here to get $40 off your first Airbnb stay!). 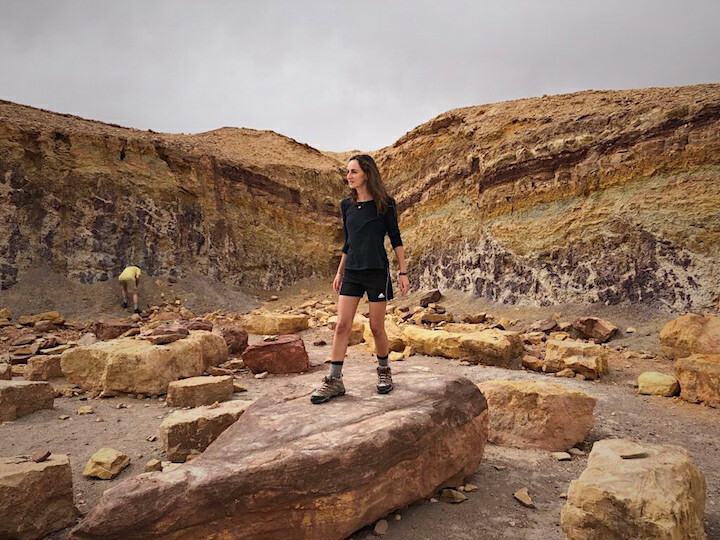 We did another desert hike, this time at Ein Avdat before driving to Ein Bokek to explore the Dead Sea region. Ein Avdat is easily my favorite hike I’ve been on Israel. It takes you through a canyon oasis in the desert. It’s a pretty easy and short hike, but if you want to do the entire thing without having to circle back, you do need someone to pick you up at the end of it after you climb up the canyon wall. We just went in and turned around instead. 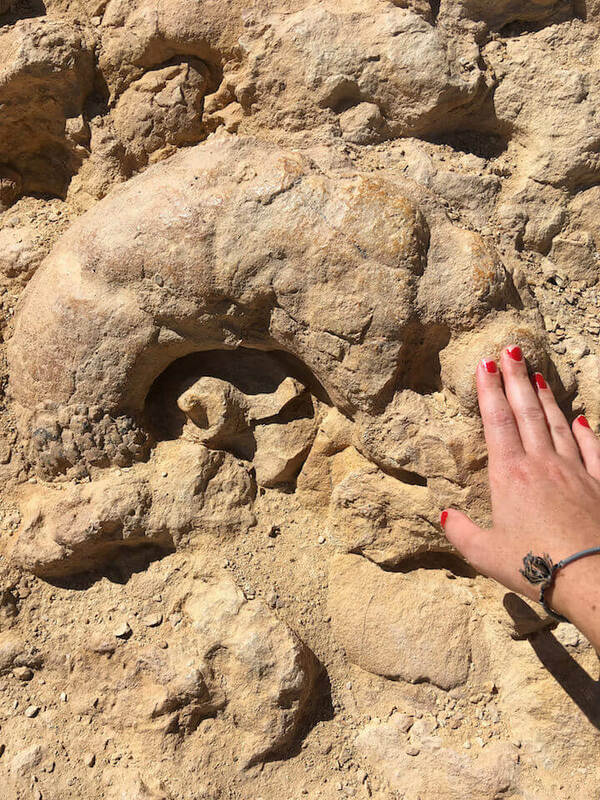 The following day, we spent the day discovering the surrealness of the Dead Sea. We grabbed some black mud from the shops on the shore of the Sea and coated our bodies in it before floating. It was so nice to take a break from the hiking and enjoy floating in the sea and spending some time in the spa at our hotel. 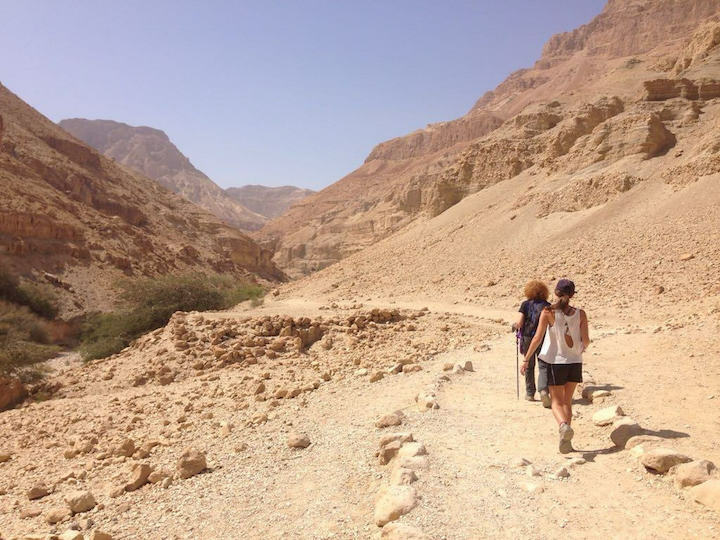 But the next day we were back at it again and headed out to Ein Gedi Nature Reserve to hike. Now: if you find the entrance packed with kids from tour buses like we did, don’t be intimidated. We gave up on Wadi David and drove to Wadi Arugot instead because we thought the trails would be overrun by kids. Once we started hiking in Wadi Arugot though, we realized the kids were just stopping at the picnic tables outside the hiking spots and weren’t actually going on the hikes. So the trail was pretty empty in the end. 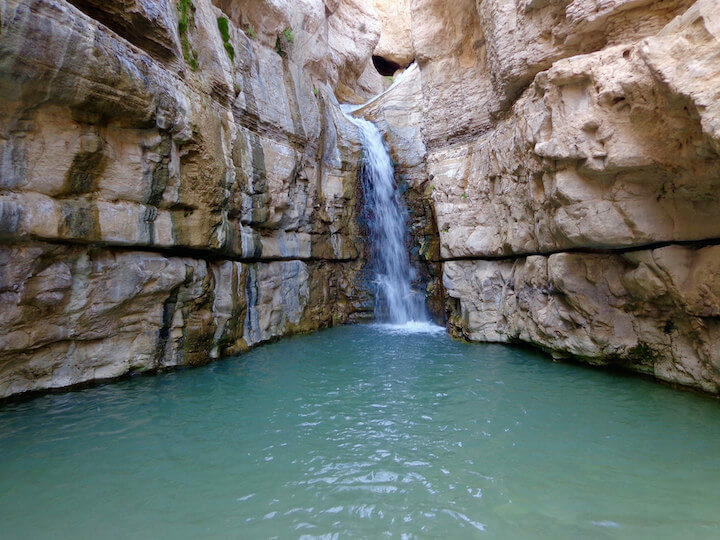 We did the hike on top of the canyon (not in the water) at Wadi Arugot and it. was. SWELTERING. BUT! You arrive at a waterfall in the end, which was sooo rewarding. Pack bathing suits and towels! While staying in Ein Bokek, there weren’t many food options. We ended up eating at Taj Mahal twice for dinner, which is basically the only decent restaurant around. We didn’t find any good Airbnb options in this region as it’s mostly resorts and hotels. 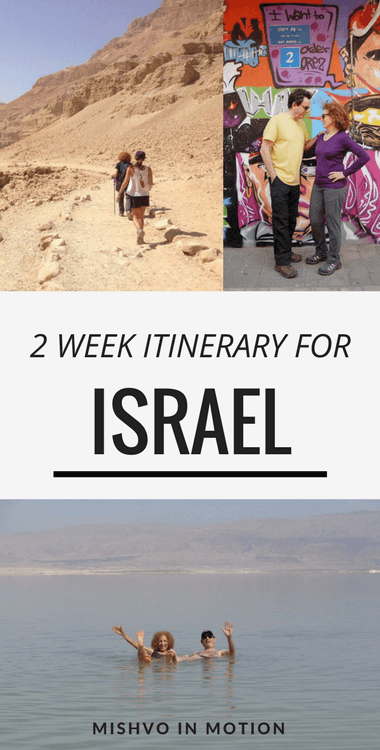 We stayed in Isrotel Ganim and I honestly found it pretty luxurious (I don’t often get the chance to stay in hotels because I’m usually on more of a budget!). THE BREAKFAST OMG. We got free breakfast there and it was the best hotel breakfast I’ve ever seen. The variety of foods was out of this world. Ten stars for breakfast. This was the part of the trip that was the least planned out beforehand since I was less familiar with this part of the country. 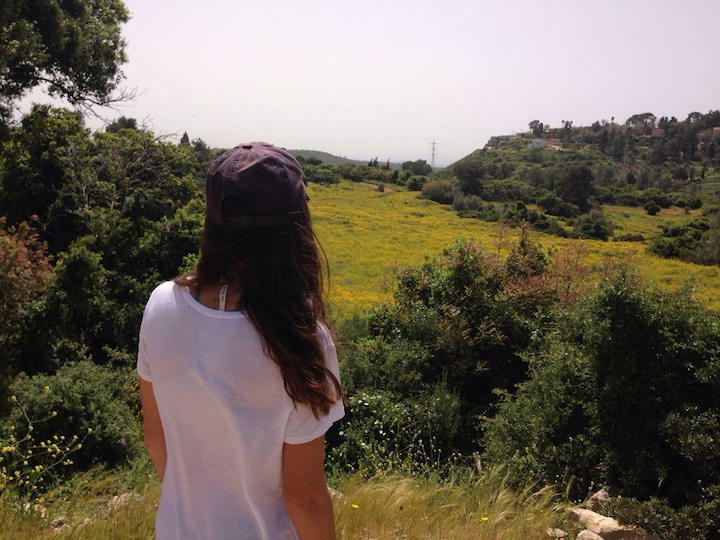 We based ourselves in Zichron Ya’acov and explored from there. 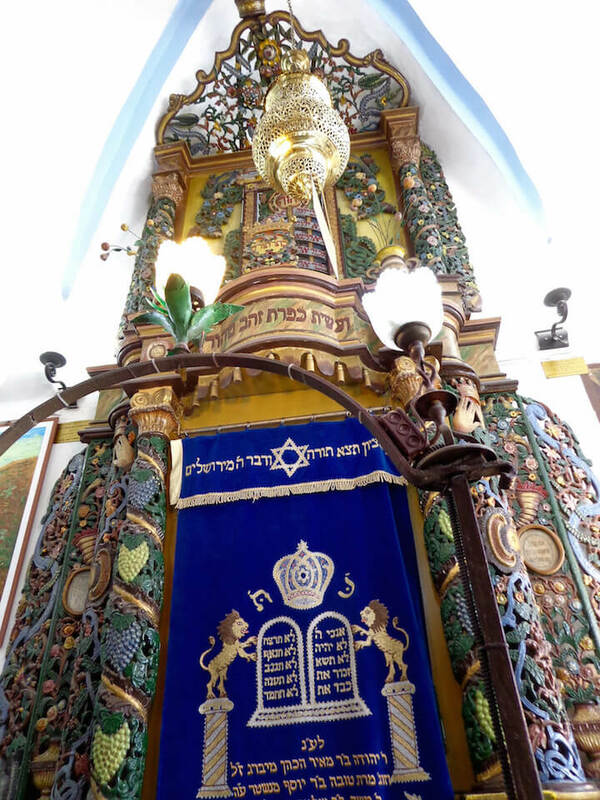 We went to Tzfat, Israel’s ‘mystical city’ famous for Kabbalah Judaism, as a day trip. We ate at Lahuhe, which serves one dish: a Yemenite ‘street food’ which is like a pizza in a crepe. It was delicious, although probably a bit pricey (like most things in Israel). 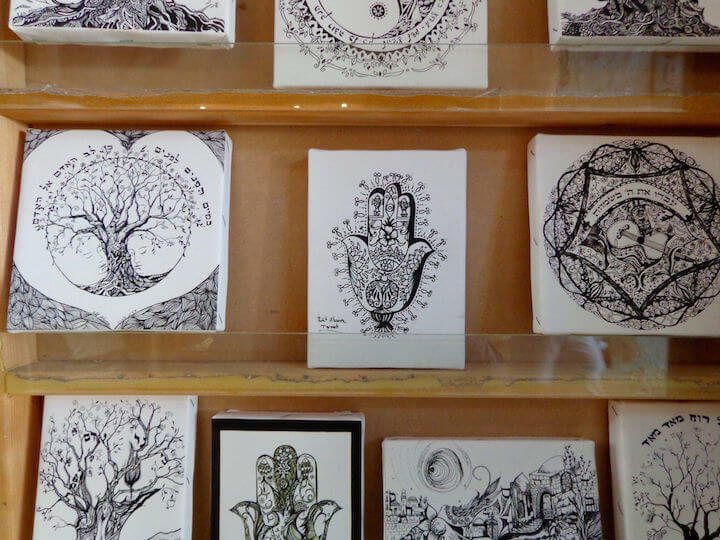 We walked along the art street in the Synagogue Quarter and looked at the galleries. I recommend going inside some of the very old synagogues on this street as well. For dinner, we went to a place in Zichron called Uma, which we liked so much, we went back to again later. The next day, we hiked at Mount Carmel. The hike was lovely — the landscape was so different from our previous hikes in the desert — but there wasn’t a lot of information about the trail or how to reach it so we had to ask around. This seemed to be a theme with hiking in Israel honestly. What’s the best time of year to travel in Israel? I’ve been in Israel in the summer (June), winter (January), and now spring (March) — the best weather was definitely during this trip, in early March. The summer in Israel is incredibly hot, but is nice for swimming and hanging around the beach if that’s your thing. When we went in the winter, it was honestly pretty cold, especially in the desert at night and in Jerusalem. Bonus is if you go in the shoulder season of fall or spring, you can avoid the big tour buses from the Taglit groups. Our last adventure was to drive to Akko for a day trip. This city is known as one of Israel’s oldest port towns with excellent seafood. So we just had to order a grilled fish with salads and hummus at Doniana overlooking the sea. Then we walked around the shuk, which was so different from others we had seen so far. Akko has a strong Muslim presence and the shuk reminded me of Istanbul a lot. Then our last day or so in Israel we didn’t do much. I think I stayed in while my parents tried to go hiking again but were thwarted by a hornets’ nest and the lack of available information about the trails in the area. 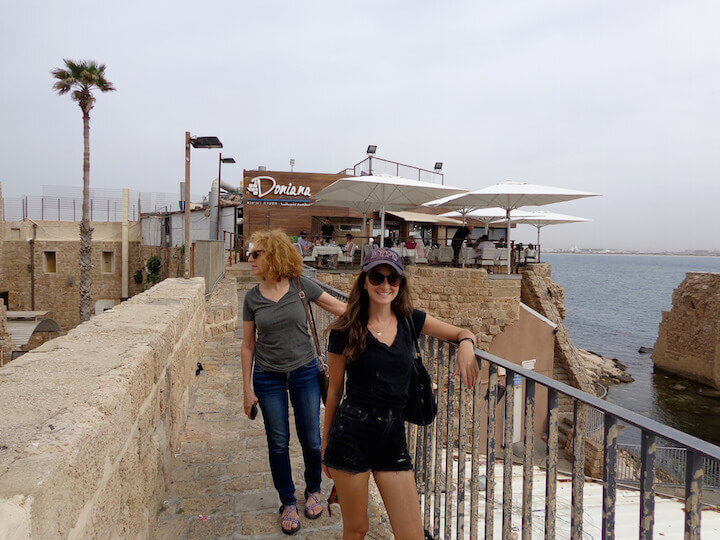 I think overall we felt like we had stayed too long in the north and like our base in Zichron was too far and the roads way to traffic-laden up there to really fully explore the region like we had hoped. I would recommend maybe two nights in Zichron then two nights in the Golan Heights. We stayed at a 2 bed/1 bath cottage house in Zichron Ya’acov. (click here to get $40 off your first Airbnb stay!). Masada (at sunrise?) – Agh did you notice this popular excursion was missing? We contemplated trying to get up to do the Masada hike to see the sunrise from the top but honestly couldn’t be bothered. 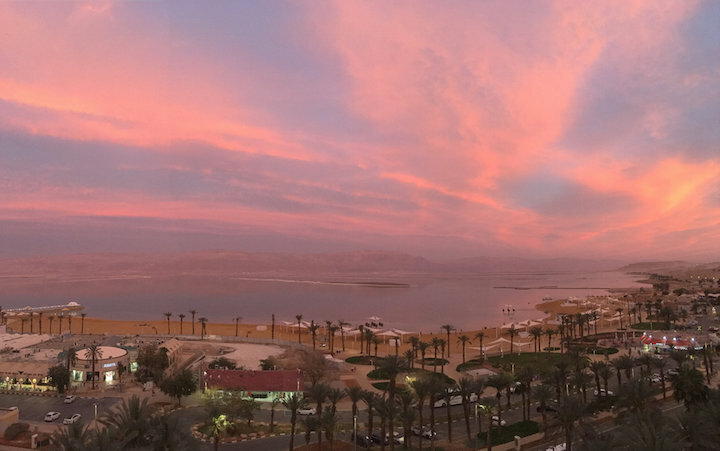 I’ve seen the sunrise from Masada twice before and it’s cool I guess but I mean that pink Dead Sea sunset we saw from our hotel window was WAY better. We bought The Lonely Planet guidebook to Israel and the Palestinian Territories before going and found it so helpful throughout the trip. I highly recommend it. Is Koh Tao a Good Place to Live as a Digital Nomad?